During the last review of the European Directive on animals in research, ADI worked hard to gain the greatest protection for primates. This included the adoption of Written Declaration 40 by the European Parliament, which instructs the European Commission to set a timetable to end all experiments on non-human primates in Europe. In May 2008, the European Commission requested that its Scientific Committee on Health and Environmental Risk (SCHER) issue an Opinion on the possibility of replacing non-human primates in research. ADI contributed to the SCHER consultation by providing scientific information on the potential for replacement non-human primates in research. Despite our evidence, SCHER concluded in their biased and deeply flawed final opinion that the use of non-human primates was still essential in a number of research areas and that a timetable for their replacement was not possible. As part of a review of the Directive, the Commission requested the Committee (now called SCHEER) update the opinion, acknowledging how rapidly evolving new non-animal technologies are. In July 2016 ADI contributed new evidence to SCHEER illustrating how the use of primates in experiments is scientifically unnecessary, particularly in research areas previously identified as “essential”, namely toxicology, infectious disease research and neuroscience. We outlined how the capacity for anxiety, depression, abuse and self-harm in primates as a result of their confinement is widely acknowledged. The Committee had once again missed the opportunity for implementing any timetable to phasing out non-human primate use. This is essential to drive the implementation of replacement and provide a route to end their use. 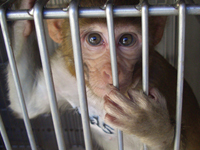 The Committee repeatedly used unsubstantiated claims about the necessity for primate experiments, such as stating that “similarities” with humans make them indispensible to research, without presenting scientific evidence. The Committee frequently misused the term “replacement” to mean the use of other species, such as mice and pigs, over primates. Replacement must mean replacement with non-animal methods. SCHEER presented the Final Opinion to the Commission in June 2017, with very little acknowledgement of the concerns raised and containing a raft of misrepresentations, unsubstantiated claims and manipulated statements. We remain deeply troubled that the Committee failed to formulate even a basic timetable for phasing out specific areas of non-human primate use, considering that they highlighted a number of areas in which there has been significant progress in alternative methods. Despite acknowledging they use the term replacement wrongly, the Committee continue to misuse this term in the Opinion and in doing, deceive the public. Additionally, the preliminary opinion outlined how researchers should accept the replacement of primates as a desirable goal, but this was removed in the final opinion. ADI have exposed the suffering of laboratory primates in Europe, with investigations highlighting the squalid setting of overseas breeding facilities which supply Europe with monkeys, as well as the conditions in one of the largest European contract testing organisations. Although the SCHEER opinion has been found seriously wanting, it does acknowledge that there is “entrenchment” among primate users which stops them moving away from animal research and that they should accept the replacement of primates as a desirable goal. For example Roger Lemon at the Institute of Neurology has been experimenting on primates for more than 40 years, despite conducting similar non-invasive research in humans. In order to break this inertia, ADI urges the European Commission to take steps to move ahead on this issue where SCHEER has failed. Read our full submission and response to the SCHEER final opinion.